CNN announced today the launch of CNN Trends, a news discovery dashboard that enables users to track and explore the Web’s most buzzed about stories. Fueled by Zite technology and sponsored by Lexus, CNN Trends identifies the most conversation-provoking news topics to pair with a CNN story and content from up to ten additional sources. The first technology integration since CNN acquired Zite in August of 2011, CNN Trends democratizes the editorial process through the social curation of news content. By matching the moment’s top news trends with additional sources and new perspectives, users can advance and expand their understanding of the topic. The result is a truly collaborative media experience. How does CNN Trends work? · Utilizing technology from Zite, CNN Trends monitors conversations through the social Web and surfaces the topics of greatest relevancy. 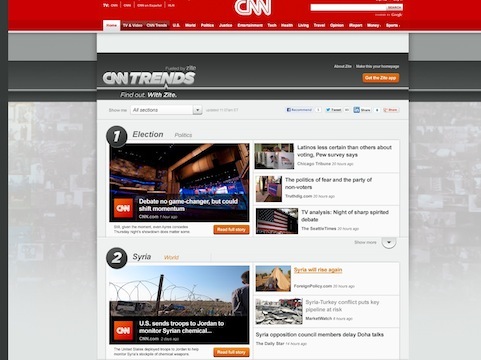 · To provide context for the user, each trend is anchored by a piece of content from CNN.com. · CNN Trends matches to each trending topic up to ten additional sources, providing users a launch pad to explore new perspectives and related analysis from a diverse array of publishers. · As the news cycle progresses, CNN Trends unearths new content and analysis to complement the evolving storyline. Available on the CNN.com desktop site and through mobile web at www.cnn.com/trends, CNN Trends will also be featured in modules on the CNN homepage, U.S. and World sections of the site. About CNN: CNN Worldwide, a division of Turner Broadcasting System, Inc., a Time Warner Company, is the most trusted source for news and information. For more than 5 consecutive years, CNN Digital has remained No. 1 in mobile news with an average of more than 21 million unique visitors per month. CNN’s applications for iPhone, iPad, Nokia, Windows 7 phone, and Android phone & tablet have been downloaded more than 22 million times to date. With 3.7 million Facebook fans and nearly 6 million Twitter followers of @CNN, 9 million @CNNBRK followers, and more than 30 million followers across all network handles, CNN is the most followed news organization on social media and has more followers than any other cable brand. About Zite: Zite is an application that makes you smarter and helps you find interesting content about your personal passions. The free, personalized magazine is available on major mobile platforms to let you dig deeper into your interests and get the information you want to know. Unlike a traditional news source which is laid out by editors, Zite uses technology to figure out the kinds of things you like to read and learns as you use it. With Zite, you can check out your favorite categories and discover new topics you’ll love. Headquartered in San Francisco with offices in Vancouver, British Columbia, Zite is a wholly-owned subsidiary of CNN. To learn more, go to www.zite.com.